Libraries are a vital part of every thriving community. The city of Manhattan Beach and its residents recognize the importance of pairing an award-winning school district with a great library system, which is why they’ve initiated the rebuilding of the Manhattan Beach Library. The construction will double the size of the previously existing library! The Manhattan Beach Library is one of the oldest continuing libraries in L.A. County, and the City of Manhattan Beach felt it was time for an upgrade. As of June, the library has been closed for major reconstruction. By June 2015 the library will be a bigger, more modern, two-story version of its former self. It is being built according to an eco-friendly design. City staff envision the building obtaining LEED gold-level certification. In the meantime while the library is closed, residents can browse the Manhattan Beach Express Library – a temporary facility on Highland Avenue. In addition, Manhattan Beach residents can use the Hermosa Beach Library. The library will be operational, but its hours and its collection will be limited. 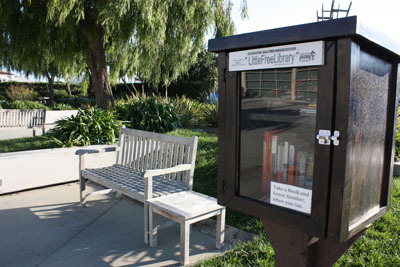 The good news for Manhattan Beach bookworms is that, thanks to a 16-year-old Mira Costa High School student, they now have access to free books from a little wooden box planted in the Civic Center courtyard. The idea spread like wildfire, and now multiple cities in most states offer a similar service, run by people who want to encourage their fellow readers in an increasingly technological world to read actual books.This is a welcome addition to the Manhattan Beach book scene, especially while the library is closed. The Little Free Library website has some great information about the program if you’d like to learn more. 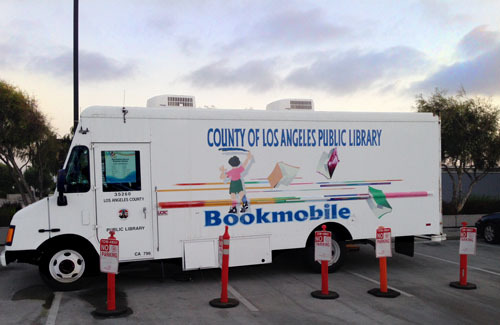 Have any of you used the Mobile library or the Little free library since the closing of the Manhattan Beach Library?